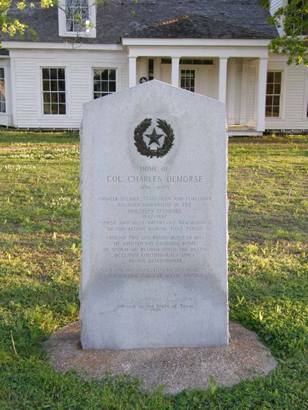 Colonel Charles DeMorse, DeMorse Home, and The Standard in Clarksville,Texas. 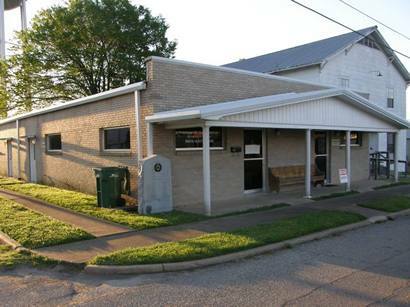 Anyone who has read a history of Texas in the 1800s will find many references to the Clarksville Standard, which DeMorse founded as the Northern Standard in 1842. It was one of Texas' foremost newspapers, largely because DeMorse not only recorded Texas history; he was one of the principal makers of it. When Colonel Charles DeMorse -- widely acclaimed as the father of Texas journalism -- died at Clarksville in 1887, he left behind what has become one of Texas' rarest buildings. 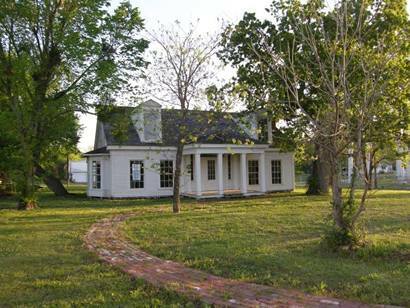 The DeMorse house, Clarksville's oldest structure, was originally built as a two-room log cabin with a central hallway in 1833, three years before Texas won its independence from Mexico. 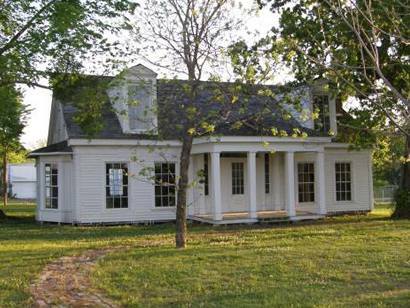 The Red River County Historical Society has embarked on a $1 million fundraising effort that could lead to the restoration of the early Greek revival home as an educational museum of early Texas architecture and the remarkable life of Colonel DeMorse. "This structure is in danger of complete demise without immediate intervention," said the Society. 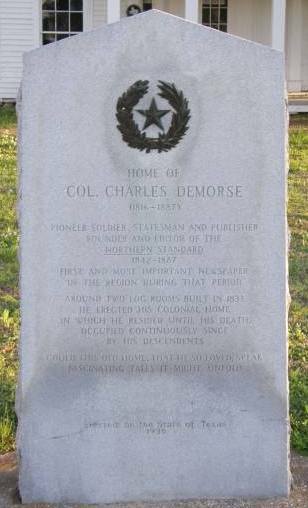 DeMorse was born Charles Denney Morse at Leiceser, Massachusetts, in 1816, and came to Texas in 1835 to help Texans in their fight for independence. While traveling to Texas he was detained by British agents at Nassau. They mistakenly listed his name as Charles DeMorse, but he liked it so much that he adopted it permanently. He served numerous roles for the new Republic of Texas, first in the Texas Navy and then the Army, as a commissioner of public debt, and as a reporter for the House of Representatives in the Republic Congress. When he founded the Standard, its first issue bore the motto, "Long May Our Banner Brave the Breeze--the Standard of the Free." The sparsely settled East Texas area, the lack of roads and mail routes, and the numerous streams and rivers that could not be crossed during floods created serious problems for DeMorse, but he persevered -- and by 1846 the paper was doing so well that it was enlarged. In 1852, he changed the name to The Standard and built a cylinder press. The only other such press in Texas was at the Galveston Daily News. 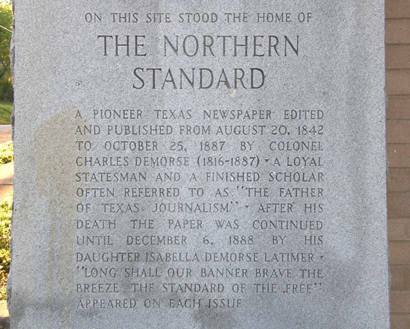 In the following years, the Standard was second in circulation among Texas newspapers and had agents as far away as Philadelphia, Boston and New York. Recognizing its influence, early Texans used the Standard as a forum for their views on statehood, the Civil War and other major political events. DeMorse often had something to say about non-political issues, too. If a particular event such as a lynching or murder caught his attention, his readers were likely to be get a good dose of his views. Morse ran the paper from its birth to his death in 1887. Only during the Civil War, when DeMorse rode off to become a colonel with the 19th Texas Cavalry, was he absent and John R Woolridge took over the paper. Even upon his death, his daughter continued the publication of the paper for about a year. The Standard was unique for 45 years because it was edited and published by a single individual whose personality, opinions and hopes it reflected, and neither DeMorse or his family wanted its control to pass to anyone else.